Personalized circular spinning metal keychains wedding favor – silver appeal with their polished charm. You can make your guests go around with merriment by getting your initials imprinted on the spinner round. 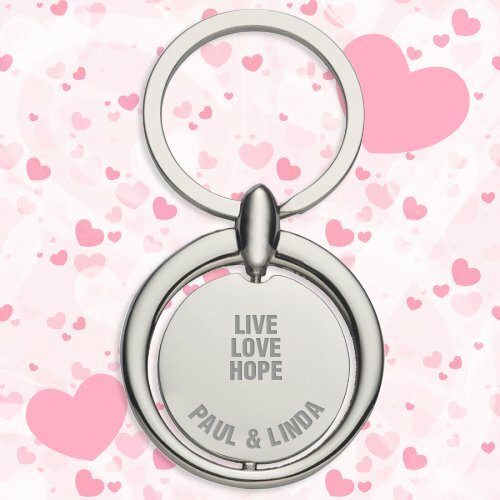 This wedding keychain is the glossiest gift, you would have ever considered because it offers you brilliant imprint space on both sides of spinner circular frame. You can add your wedding message, wedding date, or initials on it prior to gifting. Request a quote to know what you can save on ordering these custom wedding circular metal keychains-silver in bulk. Features –Silverized circular shaped metal frame with strong swivel key ring. Approximate size - 1 ½" W x 3" H "